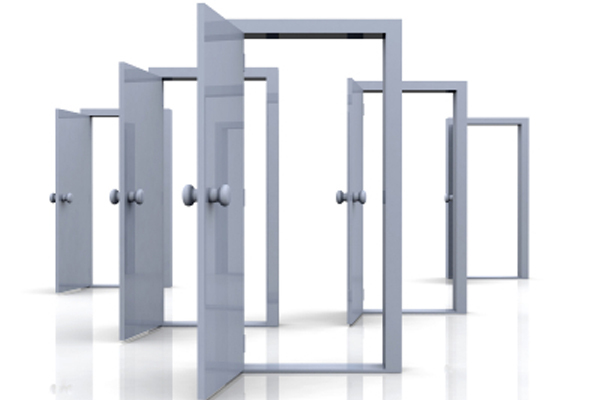 Having more than one door to peer through or entertain increases your opportunities. There are a lot of advantages to being focused and getting things done efficiently. Having plans and making them happen is fulfilling in a lot of ways. It’s also necessary when there are unavoidable commitments. However, there is a tradeoff when it comes to the bigger picture. While having a narrow focus can help with execution, it can completely blind us to the wonderful opportunities that could open up bigger and better things. For those kinds of moments to happen, it takes an open approach. It means letting go and observing. Taking in what is happening around you is critical. Otherwise, you are merely a doer. You get your checklist done, but you miss what entrepreneurs and leveraged business people understand. They see and participate in broader opportunities that can become game changers. While I like getting things done, I try to keep my schedule, commitments and projects open. This leaves room for surprise. It allows me to have meetings with unexpected people to build relationships with. An open policy creates time and space for ideas from different spheres of life to collide. From there, creativity emerges. New ways of growing a business or solving an old problem emerge. If you find yourself getting so productive that you are not open, my encouragement is to make room in your calendars and task lists. It’s a strategy that will keep you from getting to a mere predictable small goal and open up bigger visions and goals that you may not have imagined. It’s a constant tension. On the one hand, you have to get things done. On the other, being open allows you to stay close to deals which asymmetrically affect your fortunes and outcomes. Think about it. You can become so focused and busy that you miss what more open people make room for. Tragic but true.